This image is of a local apartment building located near the University of Michigan medical campus. This part of town has many rental units, but most are either converted houses or more mundane apartment buildings. 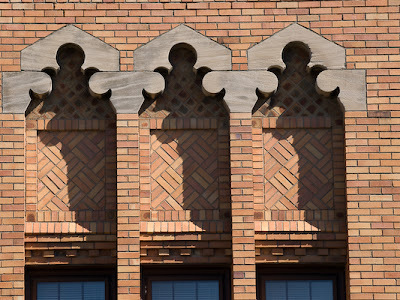 This building was built in 1929 and is a great example of the Mediterranean Revival architectural style. I took the shot mid-morning when the sun was shining on it at a nice angle and I really liked the strong shadows created by the unique architectural elements. I wasn't able to get the shot of the building straight on, there were people working on a house across the street which prevented me from getting a good angle. I ended up taking the picture from a slight angle and then relied on Photoshop to help with some perspective correction. The image above is the 'as shot' version of the image. As you can see, the image has a bit of perspective distortion because was forced to take the picture from a slight angle. The image also tilts back a bit since I had to shot at a slight upward angle. When I took the shot I figured I would have to do some perspective correction, so I made sure that I framed it a little wide so I would have extra pixels to deal with. The layers palette above only shows part of the story of the processing. I started in Lightroom and made adjustments to bring out the color in the brick. The shot was taken in bright sunshine, and the raw image sort of washed out the vibrant color that I remember seeing when I took the picture. In Lightroom I increased the black level a bit and increased some of the contrast. I adjusted the exposure and recovery a bit to bring out the color in the brick. The remainder of the processing involved performing some perspective correction and some curves work to bring out the color of the windows in the lower part of the image. When I took the shot, I noticed the blue sky reflecting in the windows and I thought it made an interesting color combination with the orange/red brick. 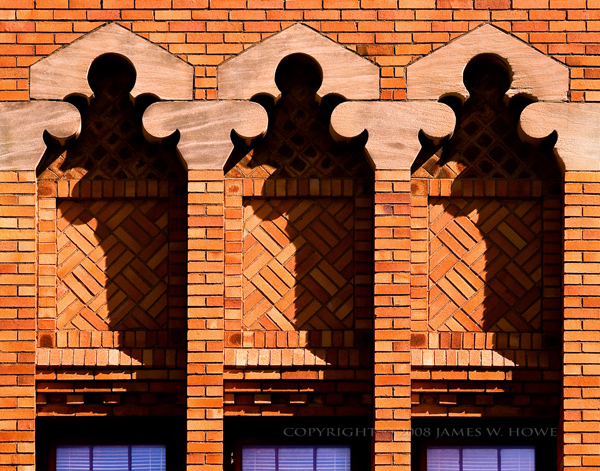 As I processed the image, the window color sort of got lost, so I added a curves layer to focus on just the windows. I finished off with a dodge/burn layer to brighten the windows up just a bit more. This image was taken with an Olympus E-3 DSLR using a 70-300mm Zuiko lens. This lens has a 35mm FOV equivalent of 140-600. The lens was zoomed to 141 or the equivalent of 282mm on a 35mm camera. Exposure was 1/400 at f5.6. Comments and constructive criticism/suggestions are welcome. This image available for purchase at my Color gallery at ImageKind.